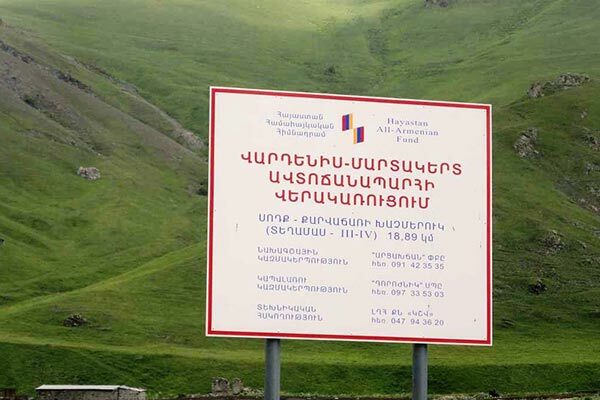 The Armenian government has allocated funding today for the completion of the construction of a strategically important road that would link Armenia and Nagorno-Karabakh. The decision to use 1 billion drams (about $2.1 million) from the reserves for the purpose comes a day after fierce fighting against advancing Azerbaijani troops was halted in Nagorno-Karabakh due to a bilateral ceasefire agreement. The construction of the 116-kilometer road that will allow an alternative link between Armenia and Nagorno-Karabakh (in addition to the existing Lachin corridor) began in 2014. The construction was funded with donations raised by the Hayastan All-Armenian Fund that dedicated two Thanksgiving Day telethons to the cause in 2013 and 2014 (raising about $12 million). Political analyst Tigran Abrahamyan thinks that the latest escalation of the conflict in Nagorno-Karabakh prompts that this vital road construction project needs to be accelerated. “Besides being important in terms of security, this road is also important for Artsakh’s economic development,” he said in a Facebook post today.